In the aftermath of the French Revolution, nearly 2,800 prisoners were beheaded on the Place de la Concorde--among them, the queen Marie-Antoinette, who was guillotined on October 16, 1793. Like her fellow victims, Marie-Antoinette spent the final days of her life in La Conciergerie, a prison within the medieval royal palace whose remnants were absorbed into today's Palais de Justice complex, which was built in the 1700s. ABOVE: A night view of the Conciergerie from the Right Bank of the Seine, with the Eiffel Tower's rotating beacon shining over the roof and chimneys. 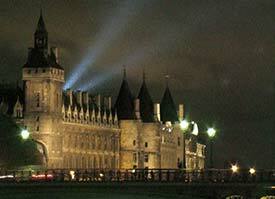 La Conciergerie is open daily year-round, with hours varying by season. Buy your tickets at 1 quai de l'Horloge, where you can also obtain an audioguide or check the schedule of guided tours. For more historical and practical information, visit the Conciergerie's official English-language Web site of the Centre des Monuments Nationaux. Also see the captioned Conciergerie pictures on page 2 of this article.